The family would like some idea of the numbers likely to attend, so if those who are definitely going could email johnwragg21@yahoo.co.uk and he’ll pass on to the family. And that just about sums up Ralph. Modest, self-deprecating, dead straight and one of the very few people I’ve met in journalism for whom nobody had a bad word, just genuine warmth. That description of himself came in a conversation he had with his son, Matt, just a few days before his sad passing on Saturday. They were reflecting on Ralph receiving Life Membership of the Football Writers’ Association after his failing health forced him to relinquish his place on the National Committee. But we would all have wanted him to hang around just that little bit longer. Because his leaving has been too soon, far too soon. The FWA has lost one of its driving forces and journalism has lost a powerhouse, even if it was a quietly understated one who was never in the business for glory and fame, but for getting the job done. It was his honesty and straightforward approach to landing outstanding stories which singled Ralph out as special. You’d never hear him boasting or even humble-bragging when he outstripped his peers to land another exclusive or get the most elusive of England line-ups when he was covering the national team. He just went about the job in the most old school of ways - cultivating brilliant contacts with a combination of absolute trustworthiness, friendship and the assurance he would never let them down. And he didn’t, not for a minute. If Ralph thought he’d upset anybody - be it a colleague or contact - he’d have been mortified. Except, of course, on the football pitch. Then he became a different beast. He was what you would probably call ‘dogged’ and if he thought somebody wasn’t pulling their weight, he was never backward in letting them know. You’d take it from Ralph, though, because he was utterly reliable, always the hardest worker on the pitch and a great man to have alongside you, even when (as was usually the case) we were getting our legs run off us by younger, quicker and more talented opponents. He was probably the most supportive of colleagues I’ve ever met, always ready with a quick word of advice for young journalists or a pat on the back and quiet praise for a pal who might have pulled a good story. His energy and enthusiasm were boundless. As the leading light of the Midlands FWA, he was the man who delivered some of the great nights of the social calendar and the leading managers and players in his patch would do anything for him. He never let them down and they reciprocated. In recent years, he WAS the FWA Golf Day, organising a splendid event, helping to raise huge amounts for charity and working tirelessly behind the scenes. 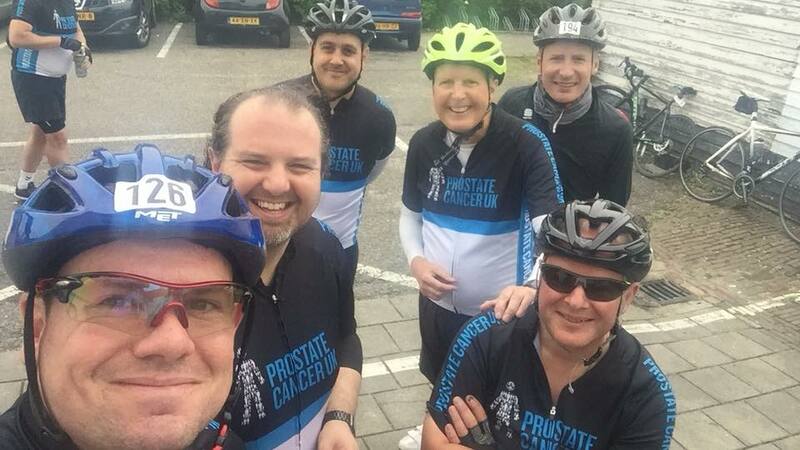 Even as recently as June he defied his doctors and cycled to Amsterdam to raise money for Prostate Cancer UK, the horrible and wicked disease which ultimately claimed his life. He may not have wanted the spotlight or praise, but he deserved them nevertheless. There wasn’t a pompous or posturing bone in his body. All Ralph ever wanted to do was the job to the absolute best of his ability, that was enough for him. His bravery was unquestioned. Where many of us have pontificated that we could do a better job than some in football authority and administration, Ralph had the courage to actually make the switch to commercial director at Bristol Rovers. And when he came back to journalism, he simply picked up where he left off but with an even keener insight into the game than those who may have shouted louder. At the FWA, we’ll miss his generosity and wisdom. His friends will miss somebody you could trust with your life. His family will miss a wonderful husband, father and grandfather who believed in the rewards of hard work and determination and never for a moment flinched from that path. Honest, modest, talented and with a legion of friends who have lost a great, great pal. Yes, Ralph, not bad for a bricklayer’s son from Forest Gate. Now there goes a fine man, a lovely human being, a generous colleague and a superb, talented sportswriter. Ralph’s smile lit up press rooms and press boxes up and down the country throughout a very distinguished career. RIP pal. So sorry to hear this tragic news. We are always positive in our tributes at such sad times but with Ralph you can only say good things. Positive, optimistic, genuine, capable, respected, reliable and so much more. And always with a smile. And that’s how we will all remember him – with a smile. Great piece from Macca which all of us would second! We’ve lost an much loved team mate, cruelly cut short. I’ll be there at Weston Super Mare to celebrate his wonderful life.